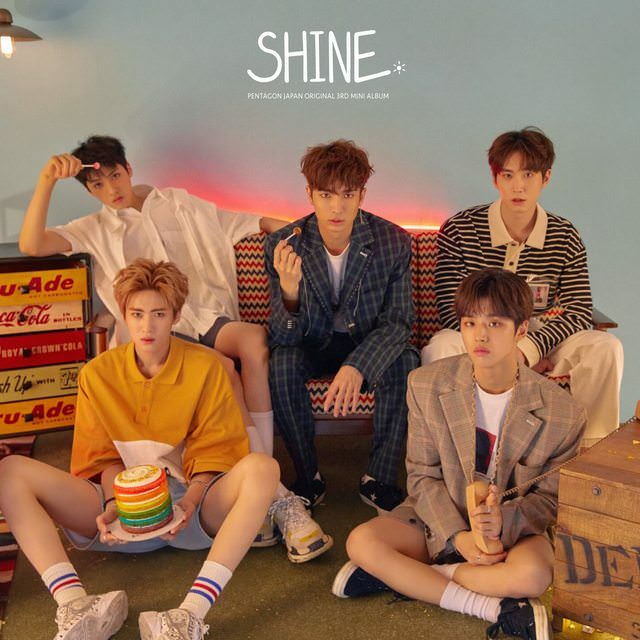 Curenly, PENTAGON is gearing up for their third Japanese album release, ‘Shine’ in August, and now the band have released three jacket covers! There will be three versions of the CD available, you can check out the details here. These three jacket covers will correspond with different versions of the album! The first jacket cover reveals half of PENTAGON – E’Dawn, Hui, Jinho, Kino and Yeo One lazily lounging around and eating sweet foods. They are dressed very casually, and one member even has a lollipop! More lollipops are on a table alongside a rainbow pancake. The next jacket cover is in the same setting, but this time features the other members who weren’t in the first image. Hongseok, Shinwon, Wooseok, Yan An and Yuto take centre stage, as the rainbow pancakes are now perched in a member’s hands! The third jacket cover features every member of the band and is colourful and vibrant as PENTAGON poses in front of a bright red background! The members all look handsome, as they give their best smoulders. The mini-album will drop on August 29th. Which version will you be getting? Target release new concept photo for ‘Is It True’ comeback!